Style, Location, Breathtaking Views, 'Zenato' has the Wow factor! Perfect for up to 6 guests, stylish 'Zenato' is a beautiful villa-style property with 3 en-suite bedrooms, a gorgeous private swimming pool and THE best location! Peaceful and private yet just a gentle 5 minute stroll from the atmospheric Old Town of Kalkan with is enticing array of restaurants, bars and shops. You can rest assured that peace and privacy reigns as the gorgeous pool and sun terraces are exclusively for your sole use. 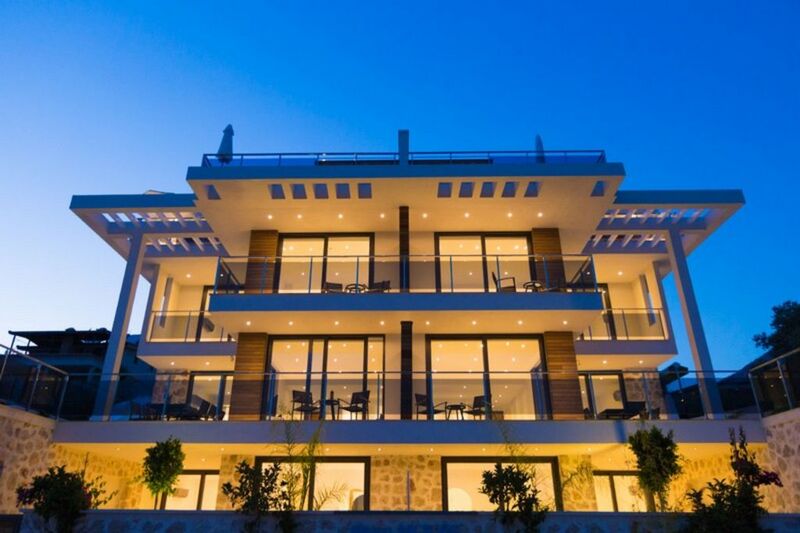 Boasting the most prestigious address in Kalkan and an enviable front-line position, it is the perfect choice for those seeking stylish, hi-spec accommodation with breathtaking sea views and a central location. This modern and spacious, villa-style property is arranged over 2 floors. The master bedroom is located on the main living floor with patio doors providing direct access to the pool terrace and providing picture perfect sea views. A further 2 bedrooms are located on the lower garden level, these open on to to a fully furnished patio and garden providing a quiet space to relax. The open plan kitchen is equipped with all mod-cons including a Nespresso Coffee Machine and a water dispenser/cooler. Zenato is perfectly situated in the exclusive Lykia Estate area, this exclusive location offers the best of both worlds, a tranquil haven to get away from it all, yet just a stroll from the fabulous Old Town with its mouth-watering array of restaurants and shops along with the gorgeous waterfront bars and bistro's of the Harbour. No taxis are required to get around, a big plus for those seeking a care-free holiday. Enjoy relaxing evenings in the Old Town knowing you are just a stroll from the villa. 'Zenato' commands an excellent south-facing position, benefiting from the most sunshine hours, amazing sunsets and a private gated entrance ensures your privacy. Proceeds from bookings are used to keep the house in tip-top condition. Our excellent management team are contactable throughout your stay should you need anything. The maids will clean and change towels/bed linen every few days and we will provide a Welcome Pack containing the essentials on your arrival. We are happy to arrange your Airport transfers with a reliable Kalkan based company who we use regularly. Getting away from it all is something my husband and I look to do whenever we have the opportunity! At home in Huddersfield, hectic work schedules keep us very busy, to which Kalkan provides the perfect antidote! We enjoy the exclusive yet central location our property provides. Being able to enjoy the many restaurants and the buzz of the old town just a gentle stroll from the house is perfect. Spending leisurely days relaxing by the pool are another favourite pastime! We have always sought to stay in high quality accommodation offering the same levels of comfort and facilities that we enjoy at home. I can therefore confidently recommend our holiday home to those who wish to holiday in comfort and style with all amenities within walking distance. High-spec accommodation, maintained to the highest of standards in a great location. Car or taxi's are not required. Stylish 'Zenato' at Mavi Su House is a gorgeous holiday home with its very own private pool and stunning sea views. Providing high spec accommodation for 2 up to 6 people, it is perfectly located just a gentle few minutes stroll from the centre of the Old Town. You will be hard pushed to find a better location in Kalkan! We are proud to boast a high number or our guests return year after year, this is testament to the service provided to our guests by our professional management team who will do their very best to ensure your stay is as enjoyable as possible and will be on hand throughout your stay should you need any assistance. Kalkan is an upmarket resort on Turkey's gorgeous Turquoise Coast and is set in a stunning bay with crystal clear water, an atmospheric Old Town and picturesque harbour. The Old Town comes alive in the evenings with a fantastic choice of high quality restaurants, shops & cafes where you can relax and enjoy the warm Turkish Hospitality and delicious food on offer. 'Zenato' offers its guests all the space and facilities of a modern villa and provides a peaceful haven to get away from it all, yet it is just a short stroll to the Old Town, Harbour & Beach. We do not like to drive or take taxi's when we are on holiday so having everything within walking distance is essential. We chose this stunning duplex as we believe it has everything to make the perfect holiday home; Location, Location, Location! All amenities can be reached on foot, it has the most amazing sea views and provides a peaceful and stylish haven to get away from it all. 'Zenato' has a contemporary, modern Villa feel, with stylish furnishings and cool decor to suit the most discerning guests. The gorgeous private pool along with the sunbathing and dining terrace is the perfect place to spend lazy days relaxing in the sun, then as evening falls, wander in to the atmospheric Old Town to enjoy dinner at one of the many restaurants. The built-in seating under the Pergola provides a shady chill-out area when required. Perhaps most crucially, Zenato is less than a 5 minute flat walk in to the Old Town. To be able to stroll out for dinner, to the shops or to the beach and return without the need for a taxi is bliss! This spacious duplex is arranged over 2 floors and sleeps up to 6 people in 3 bedrooms. We are happy to provide a discount for bookings of just 2 people. Zenato boasts 3 luxurious marble bathrooms, one for each bedroom. All towels, including beach/pool towels are provided. Housekeeping will clean and leave fresh towels every few days. Bathrobes are also provided for our guests to use during their stay. Zenato will be fully cleaned and prepared for your arrival. Our maids will change the bed linen, towels and clean every few days. Please advise if you have any specific requirements. You can park directly outside Zenato. Free Wi-Fi available, the password will be provided on your arrival. All towels, including beach towels, are provided. Fresh towels are provided regularly by the maids. Bathrobes are also provided for use during your stay. Satellite TV with English speaking channels. There is a Nespresso Coffee Machine for those who love great coffee! Fully equipped with everything you may need. The kitchen is fully equipped to prepare anything from a quick snack through to a full meal. With the fantastic climate most meals are enjoyed outdoors on the furnished terrace, however there is also a handy breakfast bar with seating in the kitchen area. English channels available including BBC News. iPod Dock in the Lounge and Master Bedroom. The lower garden terrace, accessed from bedrooms 2 and 3, provides a quiet and shady place to relax and is furnished with a sofa, 2 chairs and a coffee table. Each bedroom has its own private furnished terrace. Zenato sleeps up to 6 guests. It is perfect for couples, friends and families. Zenato's lovely pool is the perfect place to cool down on a hot day! The pool and sun terrace are tended to twice daily by our lovely pool man 'Tekin'. The pool is illuminated at night. Ensuring our guests have the most enjoyable stay is important to us, therefore our management team contactable 24 hours a day should you need any assistance. The apartment will be fully cleaned and prepared for your arrival and we will provide a complimentary Welcome Pack containing the essentials to keep you going until you can get to the supermarket. Zenato is perfect for those seeking stylish, elegant accommodation just a stroll from the Old Town and Harbour. There is plenty of outdoor space to relax and make the most of the fantastic climate, long sunny days, warm evenings and amazing views! Comfy seating under the shade of the Pergola provides the perfect spot to enjoy a morning coffee or evening drinks and the outdoor dining table, under the sail shade, is the perfect spot for lunch. Enjoy a dip in the gorgeous pool and soak up the sun by day then wander in to the town in the evening! Perfect for 2 up to a maximum of 6 guests. A splendid duplex with a stunning view! Highly recommended. We had a wonderful holiday and the residence is really in a perfect location! A fantastic base for the family to enjoy all that Kalkan and Turkey has to offer. To say this place is paradise is no exaggeration... When you arrive in the beautiful town of Kalkan, you are greeted by the bluest ocean you've ever seen, with beautiful Mediterranean houses scattered up the harbor. The home is luxurious, and elegantly decorated with gorgeous marble, luxurious fittings and with three bedrooms and bathrooms; perfect for three couples, a large family - or even a decadent romantic retreat. And the view is amazing. There's a beautiful open plan kitchen with everything you could possibly need to cook; but in a town with 200 restaurants within a ten minute walk, we found too much temptation to cook ourselves. There's great spots right on the water watching the waves lapping against the pretty fishing boats, and the rooftop restaurants have views to die for. And it's all so affordable! We loved a little spot called The Junction which had great food and smoothies and even options for any vegan gluten-free hippies you're traveling with. If it gets too hot - and the weather was spectacular the whole time we were there - wander down to Kalkan beach and swim in the clearest water on earth. Or you could flop into the pool and look out over the harbor. And of course, the whole house has air-conditioning. Check out the grand ruins in Xanthos, swim at Kaputas one of the most beautiful beaches in the world, drive along the gorgeous coast to Kekova and take a private boat tour to the ancient ruins and the sunken city. It's all right on your doorstep. We fell in love with all the neighborhood dogs and had possibly the best viewing spot on the planet to watch the blood moon over the earth, fresh out of the pool and onto the sun loungers in the warm summer night. I'd thoroughly recommend this beautiful home - it's luxurious, decadent and has everything you could want for a Mediterranean getaway. The house is immaculate - and friendly staff kept the garden looking like something out of a magazine. The pictures speak for themselves - so I'll end it here! Hi Colin. I am so happy to hear you had a fabulous stay and loved the house. I hope you can make a return visit in the not too distant future. I can't guarantee the blood moon but everything else will be spot on! All the best. Joanne. Our second year at Zenato and again I can highly recommend this property. The build quality is fantastic, the rooms are spacious, and there’s all the stuff you need (the water dispenser is a nice touch). The villa is well insulated and stays cool with the air con. Perhaps the best feature is the number of places to chill out - sunbeds by the pool, a shady sitting area and a secret garden downstairs. The support team were great -English rep, good cleaners and a guy who comes to tidy the pool area. The villa is really well located - 5 mins walk into the old town, 2 mins to a small supermarket etc. You don’t need a car unless you’re planning a lot of excursions. Kalkan itself is very chilled. Don’t come here if you’re looking for all night parties but it’s great for food with sea views, cocktails by the sea and unthreatening local shop owners. I’d highly recommend both the villa and the resort. Thank you for taking the time to review your stay. I am so pleased you had another enjoyable stay at Zenato. I will pass your kind words on to our management team who do a great job looking after the villa and our guests. We look forward to welcoming you back next time you visit Kalkan. Joanne. This was our first visit to Turkey and Zenato ,everything was lovely at the apartment, good welcome pack, very clean helpful staff everything we needed thank you Jo, we loved waking up to the fabulous view off the sea. We loved Kalkan old town with its pretty street ,shops friendly people and really enjoyed the restaurants which there are a lot off but all that we tried where very good Seaport was our favourite.We will definitely come back. Dear Gary. Thank you for taking the time to share your positive feedback of Zenato. I am so pleased you loved Kalkan and the apartment. Hopefully it will not be too long before you can return. Very best wishes to you and your family. Jo. We have been going to Kalkan for a number of years and this is by far the best property in which we have stayed . It is brand new , light and airy and tastefully furnished . Fantastic views and literally 7 minutes stroll to the old village - on the level . Zenato team are very helpful and friendly . The street is lovely and only two minutes to a little grocers . Delightful place. 'Zenato' at Mavi Su House is perfectly located within a gentle stroll of the old town. It is the perfect place to enjoy a relaxing sunshine break in beautiful surroundings and boasts picture perfect sea-views. With all the amenities of the fabulous Old Town and Harbour on your doorstep, stylish 'Zenato' at Mavi Su House is second to none! Located in the exclusive Lykia Estate it has the advantage of being just a few minutes flat walk from the Old Town, Yali and Indigo Beach Clubs and Kalkan Harbour. There is a lovely pebble beach in Kalkan with the most beautiful turquoise sea. There are also luxury Beach Clubs dotted around the picture perfect bay, perfect for those wishing to relax, soak up the sun & cool off with a dip in the crystal-clear sea. The Yali Beach Club, considered to be the best in Kalkan, is just a 5 minute walk from the house. Although the villa sleeps up to 6 guests, we are happy to provide a discount for bookings of 2 people. Please get in touch to obtain a price specific to your requirements. 'Zenato' at Mavi Su House is a luxury villa style duplex with its own private pool, providing stylish, high quality accommodation in the best location! Boasting an enviable front-line position and amazing sea views and just a stroll away from the enchanting Old Town and beautiful harbour. With your very own private pool and spacious sun terrace the lovely Zenato is not to be missed! Our Kalkan based management team, led by Gonca at Kalkan Exclusive Properties, will ensure the apartment is fully prepared for your arrival and the team will be on hand throughout your stay should you need any assistance. A full clean, linen and towel change will be carried out on a weekly basis with an additional clean and towel change mid-week. Airport transfers can be arranged on your behalf with the company we use regularly. Due to the design and layout of the property we do not feel it is suitable for children under 5 years.